I didn't recognize William behind his sunglasses and baseball cap. I usually see him driving a van around town or spot him in his mechanic's shop on Truman as in this photo I took of him in 2015. He belongs to that unseen but vital underclass of Key West residents, the ones who live normal lives making things work and keeping things working in a town dedicated to the proposition that work is a poor substitute for drinking. That attitude is promoted by the people who make money off the drinking tourism, the people who come to Key West to escape, but escape comes with an intense price tag. William knows it and like most wage earners he has an ace-in-the-hole plan to escape should the going get too tough. By boat or by van when Key West can't accommodate his modest life he will have to back away, like all of us. We chatted for a while catching up with our separate lives, me working for the city, him still wrenching at the shop. We lamented the future of Key West a city who's gentrification seems to have picked up speed in the decades we have lived here. Our marina life is more imperiled than ever though William thinks he can hold on for a while longer. Marinas on South Stock Island are no longer the havens they once were for hobos and people who wanted cheap living on a cheap boat. Well, William said to me in a parting shot, what we need is a Category Five hurricane to clear out Key West. More prophetic words were never said. We got our major storm last month and lived to tell the tale. Of course the storm decimated the poorer islands, Sugarloaf to Big Pine, sparing the second homes of the wealthy in Key West. I don't think William's hope that a refreshing storm would sweep away the people with money who are the problem as viewed from the perspective of the working class. Stock Island is a prime example of working stiffs' homes now at risk after Hurricane Irma. Clearly this sort of living, posted previously on this page, isn't safe and with developers hungrily eyeing Stock Island as their next land of opportunity and profit. The Seahorse Park residents on Big Pine, the hold outs have received their marching orders from the owner, a member of a prominent Key West family. The problem for the residents is that their modest accommodations are valuable real estate in a county that requires building permits. Knock down a trailer and you can use that as the basis for a Rate of Growth transfer and build a million dollar house in it's place anywhere you like in the county! So you can see this sort of thing is now going to get ramped up especially as trailers are clearly not safe in major hurricanes. The transformation to a millionaire society will be cloaked as a safety precaution. It has been a long hard fought struggle to get this place cleared but it seems that at last Seahorse will be no more. So where will the residents go? Who knows but I am hearing stories of people whose homes got flattened and who have no resources and precious little help from FEMA or the Small Business people and who thus are leaving the county. Which in an ideal society doesn't sound so bad does it? Survival of the fittest and all that. Even if the free market, so called should regulate everything as a practical matter you need people to do the grunt work. Already we are seeing new hotels set aside garret rooms for workers. 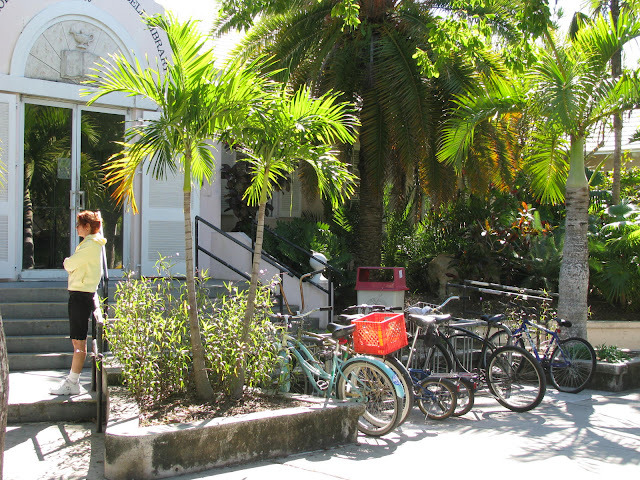 Up the Keys buses assist the commutes from low cost Florida City and Homestead for hotel workers in the Upper Keys. And on Stock Island Ed Swift built Meridian West (above) to provide worker housing. Meridian East has yet to appear, if ever. There are always proposals for affordable housing though affordability is never defined. Affordable housing is a way to make development respectable. 80 new apartments are planned near the airport and of them 24 will be "affordable." Hooray! The picture above shows what was a trailer park on Simonton Street and now is no longer in reach for working folks. So it goes... And where does this leave Hurricane Irma's effects? In my opinion the difficulties created by the storm will be felt most by the people with least. It is not going to be as William hoped, a panacea for the working stiffs. It will open up fresh opportunities for more wealth creation by the few that already have a death grip on the possibilities. A hurricane is no solution because there is no solution. The more I wonder the more clear it seems to be: Irma's legacy makes it plain that it's better to be a visitor than a resident. Whether or not you have money.